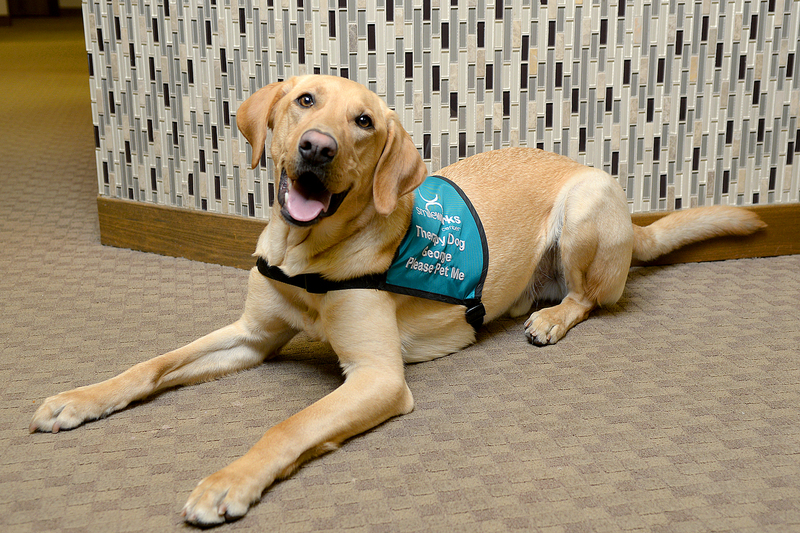 Professional Therapy Dogs aka Comfort Dogs can be a great asset to any facility. It has been shown that people who interact with Therapy Dogs have decreased anxiety, higher motivation and socialization, and of course a smile on their face. You may have encountered them in hospitals, nursing homes, schools, and sometimes court houses. George has multiple roles at Smileworks Center. He is friendly with children of all ages and helps them feel more comfortable by letting them pet and hug him. George can even hop up onto the dental chair to show the kids how he can get his teeth cleaned too! George is learning a variety of commands, however his most important trained task is to perform Deep Pressure Therapy. While a patient is laying in the dental chair, George can lay between their legs with his upper body and head resting on their abdomen. The light pressure and warmth is a calming strategy which helps to reduce blood pressure and anxiety. For adults, or children, who feel anxious at the dentist, they can ask for George's assistance and he will lay calmly with them during their appointment while they pet his head and ears.